Alligator and other reptile skins are some of the earliest worn pieces of clothing in history. The use of fur and skins in clothing is a result of the want to use the whole animal, rather than waste part of it. Along with this, the toughness and warmth the skins and furs provided the early wearers of these materials with the promise of warmth and durability. Throughout the years this worry became non-existent to the general population, and those in the middle or upper class with more secure financial means raised the demand for luxury furs and skins. This new use of fur and skins has translated into modern times as a high fashion alternative to non-animal materials. The use of fur and skins now signifies wealth and is a popular fabric to use in high-fashion accessories, such as handbag, shoes, and belts. Although exotic skins in fashion have signified wealth and luxury for hundreds of years, the trend of fur and skins has changed over the years. From being a practical measure, to the growth in popularity of these fabrics in the nineteenth century, the use of skins and furs in clothing and fashion is adaptable to the market standard. This may allow room for future changes regarding the use of animal hides in fashion, depending on the market demand. The continued use of skins of these species, such as alligators and other reptiles in this way, has made way for the practice of alligator farming. This practice is popular in the southern United States, where the climatic conditions and environment benefit the growth and livelihoods of alligators. Farms such as these are considered aquaculture, a form of agriculture that is solely water-based. Both the practice of farming alligators for their skins and the effect of aquaculture is a controversial debate among conservationists and those concerned with animal cruelty. Many believe the repercussions of aquaculture may outweigh the benefits; these repercussions include escapement, pollution of water systems, and cruelty concerns, along with the habitat loss of native alligator species in these areas that may arise from these practices. Alligator, and other reptile, farming can have both positive and negative impacts on the species in question, along with the other agents involved, such as the farmers, local governments, fashion companies, and poachers. In theory, alligator farming is supposed to flood the market with a surplus of the species, as to deter buyers from buying from poachers, as well as driving the price down so that poachers lose the incentive to hunt illegally. However, some believe that the introduction of an excess number of farmed alligators may increase wild hunting, due to the sudden increase of available sellers, the line between legal and illegal practices may not be clear to the buyer. Therefore, those in the illegal trade may have more cover and are more likely to be able to blend in with the legal sellers. These issues are partnered with local and regional government policy surrounding illegal trade and protection of species. Legal guidelines set and enforced by governments at both the local and national level, and set by international conventions, are crucial for the protection of alligators (and other reptiles) in the wild from poachers, along with the market flooding done by farmers. The use of reptile skin in the fashion industry is a controversial issue that is oft-debated in circles of both consumer research and animal welfare, with several groups lobbying both for and against their use. In contemporary times, reptile skin is regarded with high esteem as a material that is both expensive and indicative of luxury and status. The main issues that that are identified by those who are against the use of reptile skin include animal cruelty and the contribution of the fashion industry towards species endangerment and extinction. The United Nations Office on Drugs and Crime address the use of animal skins in their World Wildlife Crime Report of 2016. Their findings indicate that assessing clear sources for illegally obtained reptile skins for the vast variety of available products is "difficult to discern." However, certain types of skin have stronger connections to criminally obtained material. 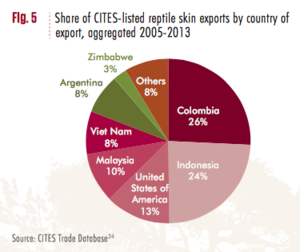 They found that half of the 24 million, legal CITES (Convention on International Trade in Endangered Species of Wild Fauna and Flora) listed reptile skins that were exported during 2005-2013 came from wild sources. 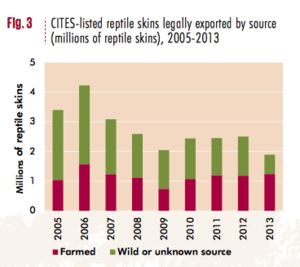 They found that this particular share decreased from 63% between the years of 2005 and 2009 to 49% between the years of 2010 and 2013, which means that approximately 14 million wild-sources protected reptiles were traded over the course of nearly 10 years. Within these reptiles, they found that "many of the species appear to be traded in relatively well-managed markets, where there is a long history of sustainable breeding or where wild populations are abundant." However, their findings also indicated that other species "have been the object of inquiries in the past and feature prominently in the World WISE seizure database." There are a variety of options to be taken into consideration when thinking about remedial actions necessary to support the conservation of reptiles. Through the combination of legal and political initiatives, reducing the financial demand and raising awareness of the issue itself, the risk to reptiles used in the fashion industry can be greatly diminished. When approaching the issue from a legal standpoint, establishing proper guidelines is essential. We can see this at play in a case study carried out in Mexico regarding the sale of reptile skins derived from poaching versus farming practices. Native species sold to the fashion industry from farming/captive breeding facilities are more sustainable in regards to the conservation of the species versus non-native species which are more widely sold. Unfortunately, the lack of a nation-wide policy to recognise the issue creates a barrier for more sustainable practices to be implemented. In order to set up these policies, the country must first “characterize the ongoing market of native species, products and by-products to determine the structure and extent of such markets.” Through the congruency of the nations data, Mexico will be able to then understand effects on wildlife that usage patterns have, as well as the status of wild species in trade which are both key elements to put national conservation management policies in place. Actions can be taken by biological scientists who also prove to be passionate activists. Along with their extensive knowledge about species at risk and the issues they face, they can take action in protection through campaigns and their activity in the conservation arena by providing a much-needed link to community outreach and education. Through their activist actions, biological scientists or bioactivists have played an extensive role in bringing reptiles negatively affected by the fashion industry's demands out of endangerment. In the example of the American alligator, the species populations have been severely threatened by the hunting of this wild species for the trade of their hides to the fashion industry. The American Alligator was hunted to near extinction and was put on the federal list of native endangered wildlife in 1964. Conservationist Fairly Carr along with other bio-activists cooperated in the establishment of a campaign to rescue this species in distress that was largely responsible for the comeback of the American Alligator. Hunting of this wild species has diminished drastically since the establishment of this campaign and these alligators are now being largely farmed for their hides all over the United States. This demonstrates a sustainable practice for the conservation of the species. The organisation established was named the American Alligator Council, also responsible for creating the Lacy Act in 1901. This act made it illegal to participate in the trade of reptile skins on an interstate basis. This also created difficulty for poachers to sell their alligator hides. 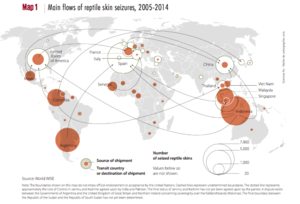 Another way to diminish the risk to reptiles exploited for the fashion industry is to create less of a demand for reptile skin products in the market. This can be done through the use of fashion companies and trendsetters to replace these skins and hides with a synthetic material that emulates the same look. This paired with a greater understanding of the issues at hand through education and awareness will help to improve the negative impact on these animal species put at risk. Bio-activists are not the only ones taking a stand for this issue through campaigns; other organisations such as PETA (People for the Ethic Treatment of Animals) work to raise awareness around cruelty, urging consumers to stay away from these products altogether, driving down the demand and allowing for affected species to replenish. One of PETA's methods for awareness raising includes the use of social media to educate and influence while simultaneously allowing readers to 'take action' by signing petitions regarding their discontent with the issue and the industry. The petition that is currently available surrounding the use of reptile skins in the fashion industry is named Please Ditch Exotic Skins and is targeted at Louis Vuitton and associated brands. In this section we invite contributions from scholars and students to widen the scope of possible solutions in addressing the implications associated with fashion accessories made with animal skins. Alligator skin handbags first started gaining popularity in the late 1800's. While other leather sources are also used to create handbags, alligator skin handbags are known not only for their high quality and texture but are also commonly associated with wealth and luxury. As high fashion items, they can be sold for prices of up to $45,000, and are thus heavily influenced by consumer demand. Historically alligator skins were obtained from wild alligators through the use of various hunting methods. Today, an increasing percentage of the skins that end up on international markets stem from alligator farms. These farms are able to consistently provide the market with a steady source of skins and often contain alligator population relief programs, where alligators bred in the farms are released into the wild. Initiatives such as these, coupled with effective policy-making have allowed many once endangered alligator species to recover back to healthy population levels. Though the standards of alligator farms are improving, many animal rights activists are still concerned with some of the abuse and animal cruelty involved in the harvesting of the skins. Organisations like PETA encourage the use of substitute synthetic leathers in attempts to decrease consumer demand altogether, but more action still needs to be taken. Effective policy and legal initiatives, as well as, increases in awareness campaigns are a few solutions still needed to ensure long-term sustainable reptile conservation.